Mix a little bit of “Orange is the New Black,” a dash of ‘80s nostalgia a la “The Goldbergs,” and even a few drops of the makeshift family angle of “Boogie Nights” and you’d have something akin to Netflix’s very likable “GLOW,” which certain fans of the right generation will know stands for “Gorgeous Ladies of Wrestling.” In this fictional retelling of the brief ‘80s wrestling phenomenon, executive producers Jenji Kohan and Tara Herrmann bring much of the same skill with extended ensembles of women to a completely different world. What the show shares with “OITNB” is an ability to quickly define an extended supporting cast to the degree that we care about a large number of characters on this show and where they end up. Yes, it’s a show about caricatures in leotards that makes you care about what happens to its characters. That’s almost a TV miracle. 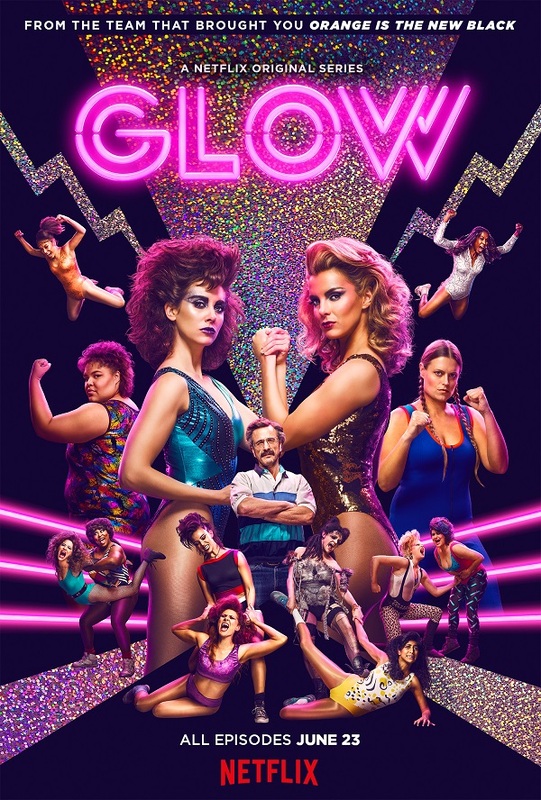 The 10-episode first season of “GLOW” has a pretty predictable arc of putting the show together with relatively expected speedbumps like running out of cash, getting cold feet, and inter-ensemble rivalries. Brie and Maron are great, but what’s increasingly rewarding about the show is how much they cede to the rest of the ensemble. Betty Gilpin is fantastic as Ruth’s former best friend, who becomes her enemy in the ring in a fantastic US vs. Russia wrestling arc that recalls the ‘80s hysteria of projects like “Rocky IV.” Britney Young as the shy solo member of a family of wrestlers, Gayle Rankin as a woman whose “Sheila the She Wolf” persona is more of a daily thing than a ring thing, Jackie Tohn as the girl who could have walked off the set of a Warrant music video, Kate Nash as the vibrant Brit who becomes “Britannica” in the ring—the cast is loaded with personality, and that’s not only what it takes to make a wrestling show work, but it’s a good thing for a Netflix comedy too. “GLOW” takes a bit of time to find its footing, but it becomes incredibly easy to watch as it develops its rhythm around episode four and one really gets to know the characters. I imagine most viewers will binge it in a day or two, and look forward to the renewal for the next season. These “Gorgeous Ladies” are just getting started.